Oct. 10, 2018 9:47 a.m.: This story has been updated with comments from Lee Zeldin’s office. 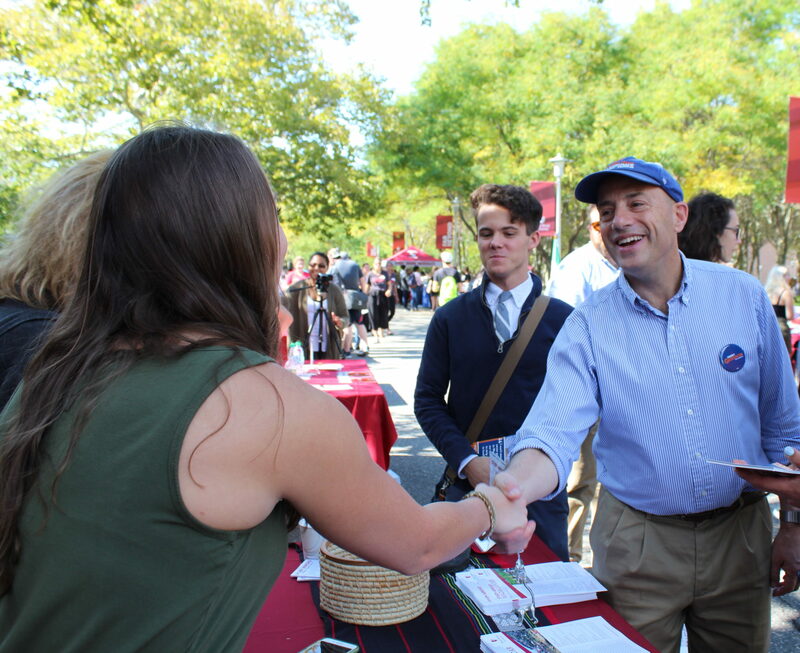 Democratic congressional candidate, Perry Gershon, visited Stony Brook University on Wednesday, Oct. 3 in an effort to reach more student voters as he campaigns against incumbent Lee Zeldin for NY-1. A Yale graduate and Long Island-based lender to commercial real estate, Gershon has focused his campaign on environmental and economic issues. As part of his economic push, Gershon said that Suffolk County’s infrastructure — highways, transportation like the MTA and communication systems like cell towers — desperately needs rebuilding to allow the region to be more competitive. He also pointed out that the country needs to take more action against climate change. Gershon said that he is in favor of increased funding for education and research at universities; he wants to address the student debt crisis with tuition-free education at public colleges and universities for middle-class families, push for fully funded federal tuition assistance programs and reduce interest rates on student loans. Gershon also wants to help find a path to citizenship for Dreamers. Gershon said his disappointment in Donald Trump’s election is what motivated him to run. He said he thinks Trump’s victory was the result of the American public’s frustration with out of touch politicians that maintain the status quo in Washington. Gershon said his community outreach efforts, including public forums, help distinguish him from his opponent. Gershon said that he has spent the past 18 months traveling the district to hear different points of view. He pointed out that Lee Zeldin does not hold town halls, and has limited interactions with his constituents. Many NY-1 constituents were angered in February 2017 when Zeldin and Peter King, another Long Island congressman, announced that they would hold town hall meetings via telephone rather than in a traditional public forum. A petition for Zeldin to hold an “open and accessible town hall” that accumulated over 1,000 signatures was put online after he canceled a public town hall scheduled for that April, citing harassment and violence at an event in East Patchogue as the reasoning for the cancellation. An official from Zeldin’s office said the April 2017 event was originally planned as a meeting with senior citizens but it was cancelled after liberal groups co-opted, rebranded and renamed it in order to attack the Congressman. When asked why Stony Brook students should support the congressman, Zeldin’s office pointed to several grants he has helped secure for the university, including a $169,000 grant from the National Oceanic and Atmospheric Administration (NOAA) and almost a million dollars from the National Science Foundation in 2017, and over a million dollars from the National Science Foundation last month. Politiccal Science Department Chair, Matthew Lebo, said that Zeldin is also expected to speak to political science classes next week. Gershon spoke to a political science class taught by Lebo last Wednesday. He also attended a Q&A with the Graduate Student Employees Union at their general body meeting in the afternoon. The Young Democratic Socialists of America at Stony Brook released a statement responding to the Q&A. Roughly 20 Stony Brook students surveyed by The Statesman on the Academic Mall said they did not recognize Gershon’s name. Brandon Spiciarich, a sophomore environmental studies major, remembered seeing one of Gershon’s commercials, although he admitted that he did not know most of Gershon’s running points. Despite this, Spiciarch said he took issue with the fact that Gershon was running on an anti-Trump platform. “Even if he did not agree with the president on everything, I think it is a congressman’s job, a representative’s job, to be able to represent the people well — not run on opposing the president,” Spiciarich said. He went on to say that hopefully, a representative would try to work with Trump “across the aisle,” and change his points of view rather than focusing on getting the president out of office. David Mayer, one of Gershon’s political advisors and a political science major, said that he submitted a flyer last fall to political science majors and minors to advertise internship opportunities with the campaign. He said that watching the politician genuinely interact with his fellow students was a major reason he joined Gershon’s campaign. Gershon will be attending a town hall hosted by the Stony Brook College Democrats on Wednesday, Oct. 10 at 7 p.m. in the Center for Global Studies and Human Development in room 202-208, featuring State Senate candidate Kathleen Cleary and sitting congresswoman Grace Meng. He walked with members of the group during Campus Life Time last Wednesday, encouraging students to register to vote. The president of the College Democrats and junior political science and English double major, Cecelia Masselli, who also works under Gershon’s campaign, said that Gershon listened to students discuss the issues that mattered most to them. “It’s great to have a candidate who is willing to take time out of his day to speak to students individually,” Masselli wrote in an email.